For Dogs and Horses! Effective in the treatment of: Hip Dysplasia, Arthritis, OCDs, Osteochondrosis, (Osteochondritis Dissecans), Bone Cysts, DJD (Degenerative Joint Disease), Epiphysitis, Osteoarthritis, Navicular Syndrome, Sesamoiditis, Bucked Shins, Bone Lesions, Slab Fractures, etc. 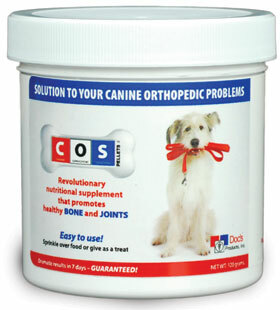 COS Pellets is effective in the treatment of: Hip Dysplasia in Dogs, Elbow Dysplasia, OCD (Osteochondritis dissecans), HOD (Hypertrophic Osteodystrophy), DJD (Degenerative Joint Disease), Arthritis in Dogs, Osteoarthritis in Dogs, Osteoporosis in Dogs, etc. 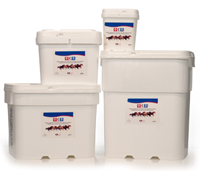 A solution to your equine orthopedic problems. OCD Pellets is effective in the treatment of: Equine OCDs, Osteochondrosis, (Osteochondritis Dissecans), Bone Cysts, DJD (Degenerative Joint Disease), Epiphysitis, Osteoarthritis, Navicular Syndrome, Sesamoiditis, Bucked Shins, Bone Lesions, Slab Fractures, etc.